I found this little lady last year. She is usually shy, but I am still usually wary still. I did my research a couple different ways. First I asked Chip to take a look. "Yep", he said, "it is just a harmless rat snake". Chip lives outside as much as he can, hunting and fishing, so I knew he knew what he was talking about. I saw another adult snake, lloked like this one but a bit different coloring. 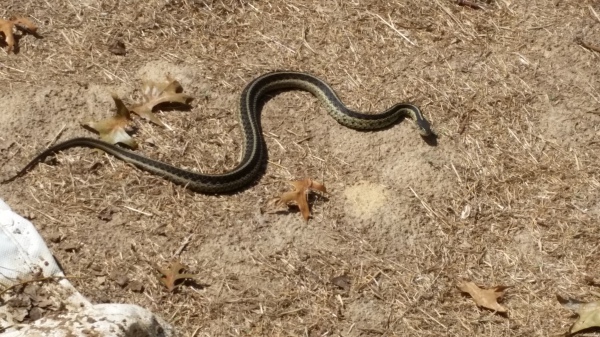 I posted a few pics of it on Facebook, and soon got comments that it was a rat snake. Or, as some called it, a chicken snake. I did a bit of online research too. The pictures confirmed what everyone was saying. Just a harmless but helpful snake. They help keep rid of the mice. Oh, and I know at least one of them was a lady snake because I found about 6 or so babies all balled up, dead, in the corner of my shed. I asked a wildlife worker at the LBL Nature Center about it, but he wasn't sure what may have killed them, but likely some chemical I had in the shed. So far this year, I haven't seen any snakes. I have been looking, and sort of hope at least one comes around. I have a few rabbits that like to frollick in my backyard. They are not eating my garden greens, just my grass and clover, but I would rather they weren't so close to my garden. I will post some pictures when one of them shows itself.